Libyan officials have been so angered by Arab media coverage of the revolution in their country they've resorted to jamming satellite TV channel transmissions from a location in Tripoli and have accused foreign reporters of fomenting unrest. The New York-based Committee to Protect Journalists (CPJ) this week said security forces loyal to Libyan leader Muammar Gaddafi continued to detain journalists and jam broadcast frequencies. "It is beyond irony that the authorities in Tripoli are inviting in foreign reporters for guided tours of the capital while they round up Libyan journalists who dare talk to foreign broadcasters," said CPJ Deputy Director Robert Mahoney. Libya's shenanigans caused Lebanon on the eastern Mediterranean to lodge an official complaint with the Arab satellite regulatory body since several Lebanese channels were adversely affected by the jamming. Earlier this week, official Libyan TV misled viewers by airing footage of crowds in different cities that it claimed eagerly awaited Gaddafi's appearance. But the deception was uncovered, according to Lebanon's Assafir daily, when it became clear the video was of the Palestinian uprising, accompanied by a background track of a song entitled "We're Steadfast Here" by Lebanese composer/vocalist Marcel Khalifa. The camera later showed Tripoli's Green Square when someone realized the mistake. Gaddafi's son Saif Al Islam, in a recent media appearance, called for "dialogue (with the rebels) before we resort to arms," and urged the convening of a "masses conference" to pass legislation ensuring press freedom. In an interview with pan-Arab daily Asharq Al-Awsat, Saif Al Islam blasted the Egyptian-controlled NileSat, which he said had unplugged, reconnected, then jammed Libya's main TV channel. He also ripped into Arab satellite channels for what he said were instigation to violence and spreading of rumors. He specifically charged Aljazeera and Al Arabiya with distorting facts about events in Libya. Muammar Gaddafi has repeatedly lashed out at foreign media since the revolt broke out, claiming they twisted his words and shed Libya in a negative light. "I don't follow [satellite] TV stations because they're a waste of time," he told a crowd of cheerleaders in Tripoli at a gathering marking the anniversary of the creation of popular committees that have supposedly run the country since the 1970s. So how does the Libyan leader define journalism and press freedom? According to Gaddafi's famous "Green Book" first published in 1975, any person is free to express himself, even if he acts like a madman... but such a person only represents himself. "The press is a means for society to express itself... not a means for a human being to express himself, so logically, and democratically, he cannot own it," Gaddafi said. The Libyan leader added that the views of a person who owned a newspaper were his alone, and any claims that a paper reflected public opinion were null and void, and, ultimately undemocratic. 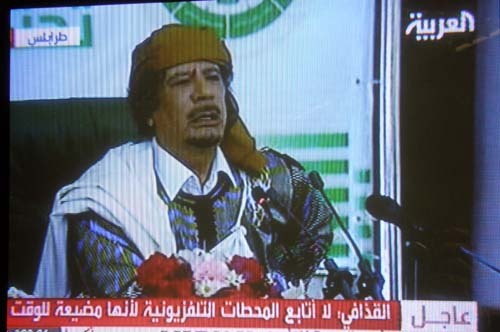 Gaddafi's definition of democracy is available in a video clip on YouTube in which he traced the root of the word to Greece, but added his own twist to it. His interpretation: Democracy comes from "demos" (Greek for people) and "cracy" (Arabic for chairs) -- the masses (or people) sitting on the chairs of power. He originally popped that explanation on a group of journalists in Egypt in the 1990s. They had a hard time keeping a straight face. On a more serious note, Ousama Alzantani, blogging in Al Mashhad Al Libi (the Libyan Scene) said there were two types of journalism in his country: the father's (Muammar Gaddafi's) mediocre press, run by people's revolutionary committees, and the son's (Saif Al Islam's) press, tailored to the son's despotic whims. "Saif Al Islam's understanding of the press, its freedom and its importance to society is akin to his father's," blogged Alzantani. "He understands nothing." Anti-Gaddafi Libyan journalists and activists have complained of harassment and lack of press freedom for decades. Anti-regime journalists in Tripoli said they were threatened with assassination for refusing to obey Gaddafi's orders to launch a media campaign suggesting he was still in control of the country after various cities and towns had fallen to rebel control. The journalists said they communicated in code on their mobile phones for no longer than two minutes to avoid detection by Libyan security services. "We speak only in English and in spurts as we're being watched," a reporter chatting on his Facebook page told a reporter. The Paris-based watchdog Reporters Without Borders said in November that Libya ranked 160 out of 178 countries in its 2010 press freedom index, and that Muammar Gaddafi was still on its list of the 40 "Predators of Press Freedom." 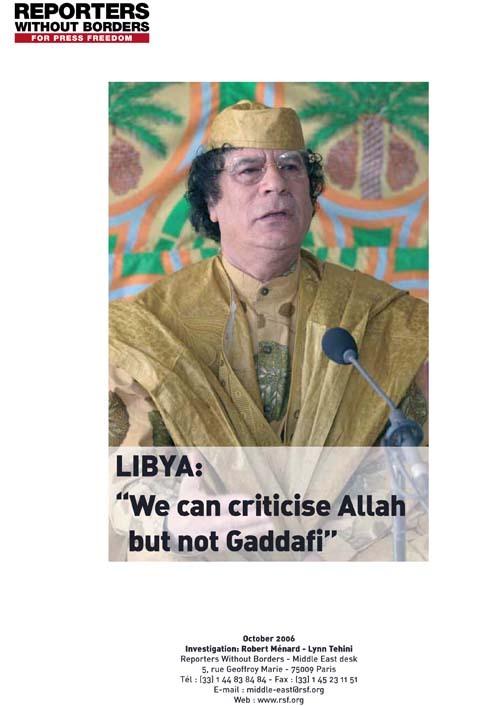 In 1996, RSF published a report entitled Libya: "We can criticize Allah but not Gaddafi" in which it referred to a "relaxation" of restrictions on the media, but noted that journalists critical of the regime spoke to its representatives in hushed tones for fear of reprisals. If anyone voices astonishment at this lack of independence, there is a ready response. "We don't need privately-owned newspapers," a member of the Press Union told Reporters Without Borders. "Libya has direct democracy. The press is an emanation of the people."